From the outside, it looks just like any other canal house in Amsterdam—gray, white, and generally unassuming. But inside, there’s a different story altogether. It’s a story of religion, of ingenuity, and of making do under challenging circumstances. The story of Our Lord in the Attic is intriguing and unusual, even if you think you’ve seen all there is to see when it comes to European churches. 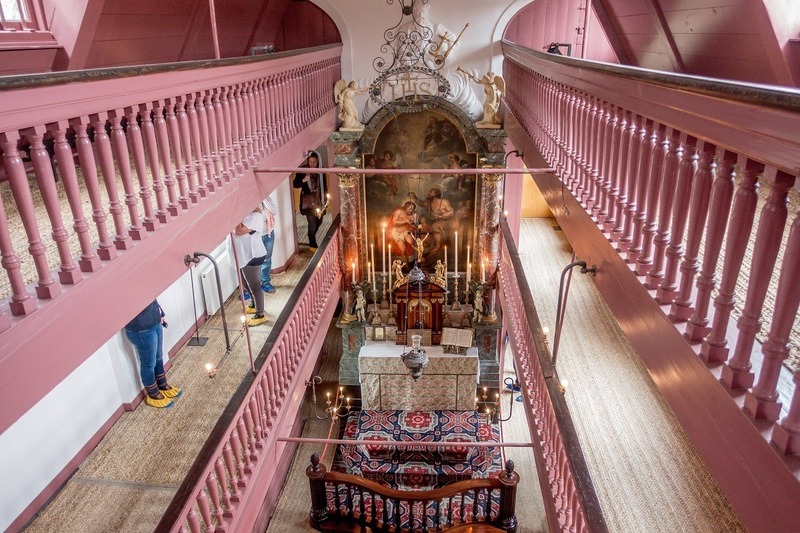 It’s hard to imagine something being hidden in the heart of Amsterdam right along one of the lively canals, but that was the case for Our Lord in the Attic (Ons’ Lieve Heer op Solder, in Dutch) for over 200 years. 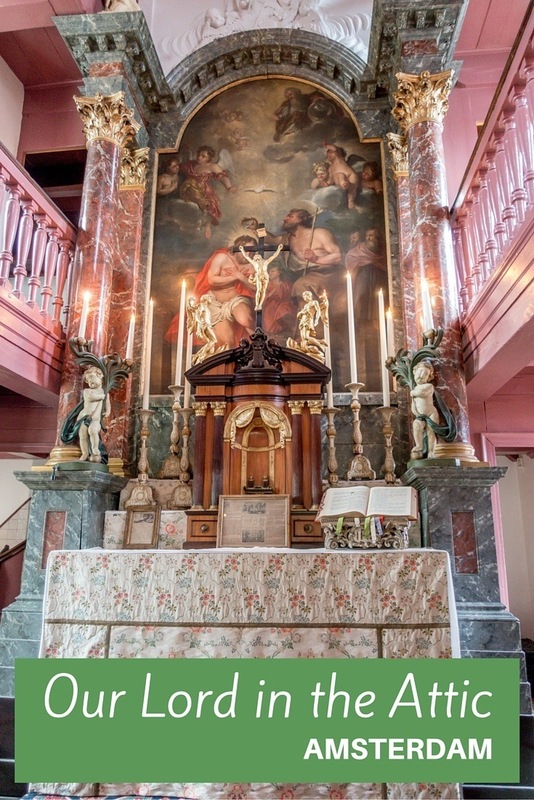 This unique Catholic church was built in the early 1660s in the three upper stories of a canal house, out of pure necessity. 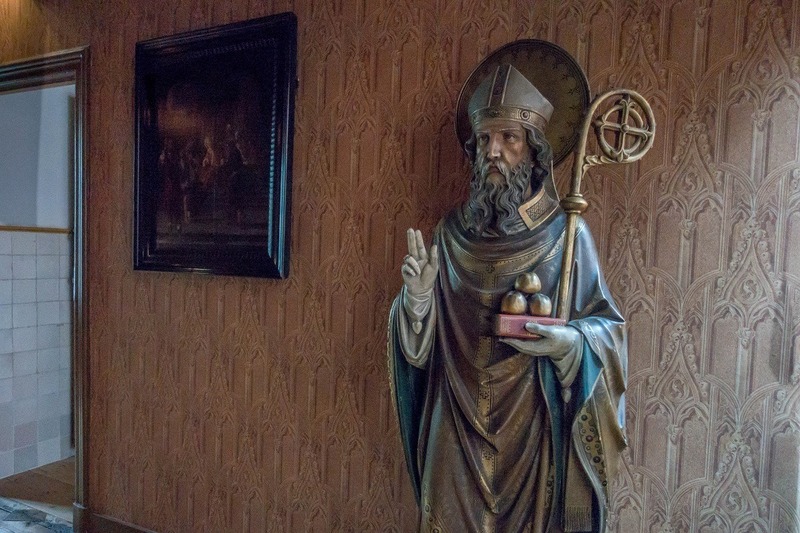 The previously Catholic Amsterdam had officially become Protestant some decades before during the Reformation, and it was no longer permissible for Catholics to practice their religion in the open. But a clandestine church that didn’t look like a church was just fine. Thus, Our Lord in the Attic was born. The front and lower stories of the building were fairly representative of the time. There was a shop in the front, and there were typical bedrooms. 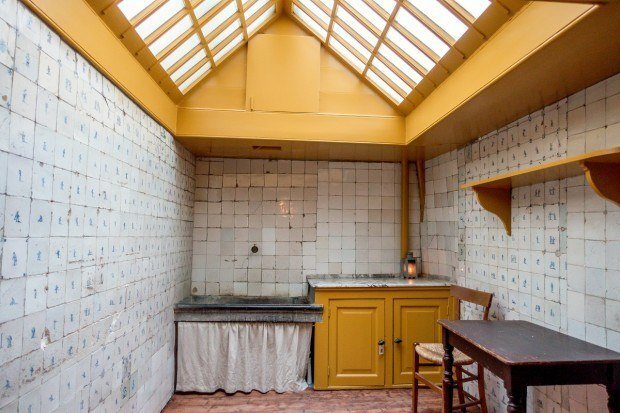 A formal reception area welcomed guests, and there was a normal kitchen, complete with famous blue-and-white tiles from neighboring Delft. But once a visitor stepped through the hidden door in the living room, everything changed. 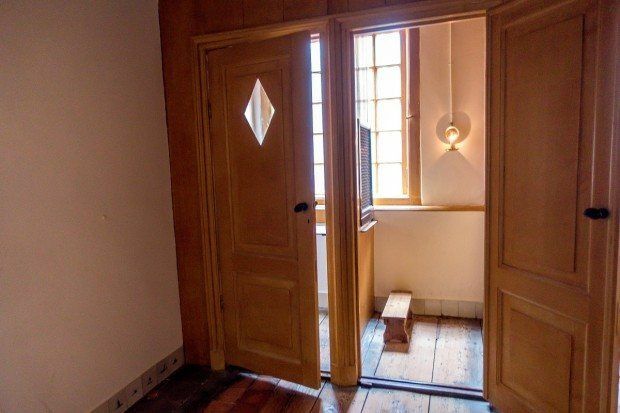 From here, a narrow staircase led visitors up to the stunning church in the attic. Today’s visitors to Our Lord in the Attic can take the same journey that parishioners took three centuries ago through the corridors and up the steep stairs. As you near the top, it’s hard to believe the transformation. 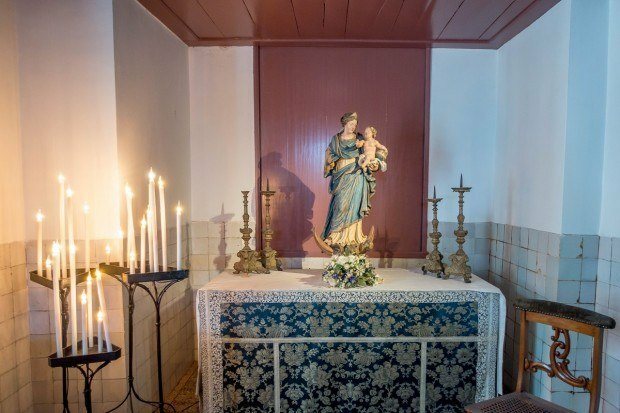 This is not a makeshift church in someone’s living room—it’s a full and proper church, complete with an altar, an organ, and seating to accommodate 150 worshipers. The focal point of the sanctuary is the Baroque altar that was added about 50 years after the church was constructed. The tall altarpiece, which shows Jesus’ baptism by John the Baptist, is topped with a stucco image of God and the Holy Spirit, portrayed as a dove. Through a combination of architecture, sculpture, and painting, it creates an illusion of space as it extends upward to the ceiling of this unusual room. In the small space, virtually every square inch is used. The pulpit is movable and can be stored in a cupboard when not needed. In addition to the traditional seating, two wooden balconies (painted a pinkish shade that dates from the 1860s) run the length of the church to accommodate additional visitors above the main action. And the space conservation extends beyond the sanctuary. The confessional area is located in a not-very-private back room. Nearby, in the priest’s sleeping quarters, a bed built into the wall provides a bit of extra room to move around. All the structures work together to make the church function in this remarkable space. A tour of Our Lord in the Attic is a step back in time. Many of the floors and furnishings here date back about three centuries. 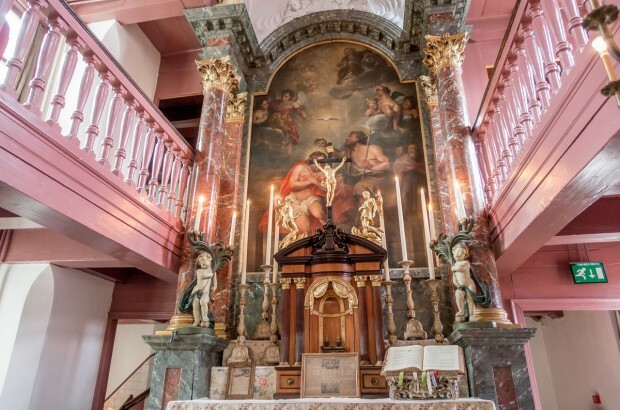 On a walk through the building, you can see the original ecclesiastical gold and silverware, a secondary altar from 1690, and many pieces of 16th-century artwork. All these remarkable items stand beside the decorations that went into making this spectacular building look–from the outside–like nothing special. I was the guest of Iamsterdam , using my Iamsterdam card to visit the museum, and I stayed at the NH Amsterdam Zuid. All opinions of the secret and historic are my own. Do you like visiting churches around the world? Which one is your favorite?